This article describes how to set up a Publication Channel in Enterprise Server 9 for publishing content to Twitter. Step 1. 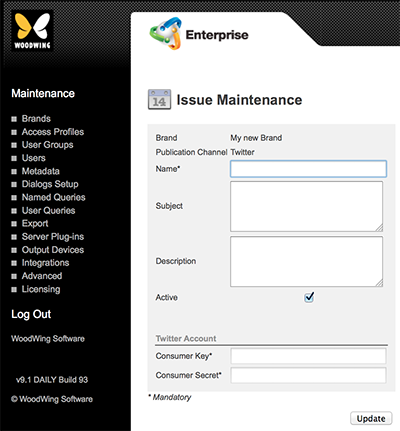 Access the Brand Maintenance page. In the Maintenance menu or on the Home page, click Brands. Step 2. 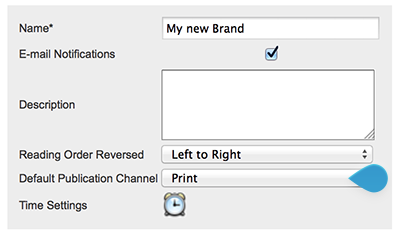 Locate the Publication Channel options. The Publication Channel Maintenance page appears. Step 4. In the Name field, enter a name. Step 5. In the Description field, enter a description. Step 6. From the Publication Channel Type	list, choose Web. Step 7. From the Publish System	list, choose Twitter Publishing Connector. Note: When this option is not available, make sure that the Twitter Enterprise Server plug-in is installed and enabled. Step 8. Leave the Suggestion Provider option set to None. An additional property named 'Current Issue' appears below the Publication Channel Type property. Since Issues still need to be set up, we will come back to setting this option later in the process. Below the Publication Channel properties area, a section for adding Issues appears.We will add these now. Step 10. Click Add Issue. The Issue Maintenance page appears. Step 11. Fill out the details. Name. Name of the Issue. Subject. This feature is currently not functional. Description. Description of the Issue. Active. Use to deactivate the Issue. This will hide the Issue and all objects assigned to the Issue from the users without actually removing the Issue from the system. Consumer Key: Obtain this from the Application Details page for your app on https://dev.twitter.com. Consumer Secret: Obtain this from the Application Details page for your app on https://dev.twitter.com. Step 13. Click the arrow at the bottom of the page to return to the Publication Channel Maintenance page. Step 14. (Optional) Add additional Issues as needed. Step 15. Click the arrow at the bottom of the page to return to the Brand Maintenance page. Step 16. (Optional) Add additional Publication Channels as needed. Step 17. (Optional, only if multiple Publication Channels have been created) From the Default Publication Channel list at the top of the Brand Maintenance page, choose the default Publication Channel that should act as the default Twitter channel. Note: In order for this feature to work properly, it is imperative that an order sequence for the created Issues is correctly specified on the Publication Channel Maintenance page. If this is not done (or not done correctly), Enterprise may not be able to properly determine the Previous and Next issues. Figure: The Default Publication Channel list.